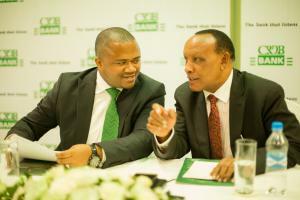 NAIROBI, NONE (INTERNATIONAL), KENYA, October 10, 2018 /EINPresswire.com/ — Dar es Salaam Tanzania, Wed Oct’ 10, 2018 – Tanzania’s largest commercial bank CRDB Bank PLC has appointed Abdulmajid Mussa Nsekela as new CEO & Managing Director. Mr. Nsekela, 47, takes over from Dr. Charles Kimei, who proceeds on retirement, after more than two decades at the bank. Mr. Nsekela rejoins CRDB Bank from National Microfinance Bank (NMB), where he served as Head of Retail Banking. Speaking during a press briefing in Dar Es Salaam Wednesday, CRDB Bank PLC Chairman Mr. Ally Hussein Laay said Mr. Nsekela brings on board immense experience, drawing from his extensive background in Retail Banking and International Banking & Finance training. “We have found a dynamic individual, who has great passion for banking; and this is a quality we believe CRDB Bank needs in these extremely competitive times. We are confident that our new CEO will deliver great results, in the wake of Dr. Kimei’s gracious exit from active corporate leadership,” Mr. Laay explained. Dr. Kimei, who has opted for early retirement, has been at the helm of the bank since its establishment in 1996 and is credited with steering the transformation, which has seen the organisation grow into a large and reputable financial institution in Tanzania. “Dr. Kimei’s invaluable contribution to this Bank cannot be gainsaid. He has devoted his life and skills to build a solid institution that is changing millions of lives across Tanzania and beyond,” Mr. Laay said. The Chairman also assured that the bank is currently implementing a transition plan to ensure business continuity. In his maiden address to the media, Mr. Nsekela expressed excitement and optimism for his new role and undertook to build on the strong foundation that his predecessor Dr Kimei has laid for the bank. “The banking industry today does not respect tradition – it only respects innovation. I strongly believe that this is a critical time for CRDB Bank to do more so as to thrive in this highly comepetitive environment,” he said. Mr. Nsekela is upbeat about the CRDB Bank’s business prospects and has intimated championing a renewed focus on digitization, optimizing business processes and achieving operational excellence as his key priority areas in the short term. “We want to enhance our customers’ experience by reviwing our working procedures and improving our core banking system. Additionally, we will embark on a digital transformation journey so as to make our services more accessible and friendly,” Mr. Nsekela quipped. The New CEO undertook to put more investment in staff training and build rosoruces to empower service delivery. The appointment of Mr. Nsekela comes even as CRDB Bank continues to implement strategic changes, with a view of improving the customer experience and a deliberate plan to grow revenue. The Bank’s Board of Directors has expressed optimism in the new leadership and assured stakeholders of a a more aggressive business strategy to spur growth.